The Complete Bariatric Surgery Guide - Types, Cost, Diet, Pros/Cons, etc. There is no doubt that obesity is difficult to conquer. Especially for the morbidly obese. Being extremely obese myself, I know the odds of ever succeeding against the body’s will to gain weight are highly skewed. In such a bleak scenario, a bariatric surgery can be god sent. Especially when the person is well aware that the surgery is just to give them a “head start” and is not a permanent solution. Meaning, they WILL have to complement the results of the surgery with some major lifestyle changes. However, if you are prepared to do them, then this surgery can be a life saver. So many of the mid to late life health problems are based on medical complications from excess weight. From diabetes to heart disease, to greater instances of cancer, being overweight is simply not a healthy lifestyle. In addition to physical ailments, there is also the mental toll of being overweight. Depression and anxiety are highly correlated with obesity and often these ailments go untreated as patients seek to not treat these serious mental disorders. It is my hope that by completion of this two-part post (part two is here) you have all of your questions about gastric sleeve surgery answered. From the benefits and disadvantages of the procedure, to the post-surgery complications and effects, you will have a clear picture of what to expect both before and after the procedure. It’s time to make an informed decision, to know what the future holds for you or a loved as the choice is made whether to undergo surgery. Continue reading and have all of your questions answered, including ones that you may not have yet considered. Current day bariatric surgery is the culmination of research and the development of procedures during the mid-twentieth century. During the 1950s, open procedures on the stomach were conducted for a variety of specific health concerns. These ranged from bile duct stones to blockage in the lower intestines. The reasons for surgery early on were not related to obesity or meant with the intent of having a patient lose weight. It was during these early days that the foundation of intestinal surgery was formed. Today we have multiple types of bariatric surgeries. Techniques for reaching the intestines and colon were developed to solve these specific health concerns, but in this research and development came anastomosis. This is the cornerstone of current day bariatric sleeve surgery that helps people lose weight, and it wouldn’t be possible without the techniques developed during this time. Anastomosis is the process of connecting two disparate sections of the body, after removing a section in between that was the source of an ailment. In the stomach and intestinal tract this was done for treating specific illnesses. Parts of the intestines or stomach needed to be removed as they were the sites of ailments. Using this technique, a surgeon could reconnect two parts of the stomach or intestine and they could serve the same function. At the time this was a medical breakthrough. The ability to have a functioning intestinal tract while still removing a large section of the stomach was a difficult process to master, and in addition to advances in surgical tools there was a steep learning curve for surgeons willing to undertake the procedure in these early days of surgical operation. In recent decades the advances set about in the middle of the last century led to procedures specific to the function of losing weight. There is little doubt that you are familiar with the term ‘stomach stapling’, as this was the first common procedure practiced, and it gained prominence in the 1990s. This procedure is not all that different from current day bariatric band surgery, however several steps required for stomach stapling have been removed. In addition, the main implant to control the size and flow through the intestine has been adjusted to a duodenal switch. This relatively simple implant functions as an elastic band placed near the top of the intestine, after a large section has already been removed. It is a far cry from the early days of the procedure and works not only in the same mechanism as stomach stapling, but allows for a far less invasive surgery and has reduced costs significantly. Today, it is the most expensive of the three most common surgical options, with gastric sleeve surgery being the cheapest. The band can be loosened if needed, and it is placed in such a way that adjustments can be made easily and with a short minimally invasive process. The surgery as we know it today, serves the primary function of aiding a patient to lose weight by shrinking the total size of the stomach by around seventy percent. There is a range in how much of a reduction is done to the stomach, in extreme cases the stomach being reduced by an overall of 85%. Intuitively, you know that this means the patient cannot ingest as much food, but in addition to the pure physical reduction, there is a far more important change that takes place. It reduces the production of ghrelin, a hormone that stimulates hunger. This severe reduction leads a patient to not develop the cravings for food that led to their significant weight gain. Bariatric sleeve surgery is an offshoot of gastric bypass surgery and the later development of the adjustable gastric band. This surgery is the fastest growing stomach surgery in western countries, with a high success rate among patients losing weight and keeping it off for life, based on present day survey data. A large portion of the stomach is removed and the surgery is not reversible. This differs from use of the gastric band as a smaller section of the stomach would be removed, and over time the remaining section could inflate if a patient is not careful with their dietary habits. The more extreme measure in bariatric sleeve surgery results in greater instances of patients losing weight in the long term, however data sets, while robust, do not feature a number of years in the same way that earlier stomach procedures do. The surgery is almost always conducted with a small incision in the abdomen. From here, laparoscopic tools are used to remove a section of the stomach through the small incision. This is a major factor for why the surgery has risen to prominence in recent years. Laparoscopic surgery uses tools with fiber optic cameras that are moved through the body through a small incision instead of requiring a large, open incision. The advantages here cannot be understated. It reduces the costs significantly, as well as the recovery time and instances of complications. Much of the problems stemming from open surgery are rarely the procedure itself, but rather the risk of issues stemming from the invasive incision in the abdomen. It requires a different degree of anesthesia and greater surgical mastery of the procedure. That is not to say that current day bariatric sleeve surgery is a simple process, but rather that it has come a long way from the early days of reducing a patient’s weight through surgery. 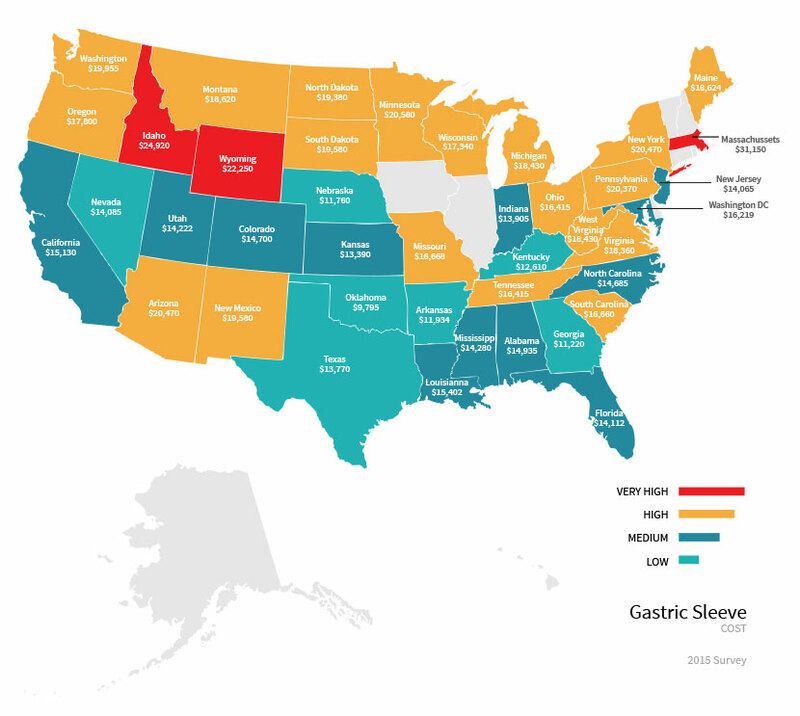 The high success rate using a sleeve in bariatric surgery, along with the relatively low cost, has led to a large increase in the practice. This in turn has led to further reductions in cost as the procedure has become standardized. Very recently, in the last three years, the surgery has become popular in eastern countries as obesity cases are on the rise. The success rate of the surgery, measured in weight loss, is extremely high, with patients losing around fifteen pounds per month on average. This number varies greatly from patient to patient depending on their starting weight, gender, and height. The wide spread practice of the surgery has seen a great increase in the number of patients that qualify. The Body Mass Index (BMI) of a patient is typically over 40, however in recent years this has fallen to a range of 35-40, and there are some advocate groups that would like to see the surgery practiced on BMIs even lower than 35, depending on patient history. The age requirements for the surgery have also fallen in the last five to seven years, with the procedure now being recommended to patients as young as fourteen. However it is applied far more commonly to patients eighteen years and older. Certain groups have made a case for the procedure being done on patients younger than fourteen, however the pushback has been far greater than in the advocacy of surgery on those with a BMI of 35 or less. It is worth noting that most doctors do not recommend bariatric surgery lightly to someone who wants to lose weight, and it is still seen as an extreme measure to combat complications from obesity. Comorbidities, that is two diseases present in a patient, raise the frequency of recommendation of bariatric surgery. It was not long ago that comorbidities would disqualify patients from bariatric surgery, however due to the non-invasive nature of bariatric sleeve surgery; it is highly recommended to patients suffering comorbidities. Do You Or A Loved One Qualify? It’s a complicated question that needs to be discussed with your primary care physician; however, there are some guidelines that could get the discussion started. Patients who qualify for bariatric sleeve surgery are typically eighteen or older, and have a BMI of 35 or above. Outside of the BMI scale, a patient that is over 400 pounds will almost certainly qualify, as this is the cutoff where the surgery is deemed to be at its safest. A patient should have tried numerous ways to lose weight in the past, typically by modifying their diet and including exercise in their weekly routine. Bariatric sleeve surgery recovery is a short period of time, and the costs are fairly low, but that does not mean it is not still a mentally and physically taxing procedure, as well as costing what amounts to a large sum of money for many families. It is always recommended that a patient attempt to diet and exercise before considering surgery, and that they understand surgery is simply an aid to losing weight and not an immediate solution that requires no effort on the part of the patient. If a patient has tried diet and exercise but has struggled to lose weight, then bariatric surgery might be the answer. Once surgery is complete, then a patient must stick to a strict diet to get the proper nutrition. The extreme reduction in the size of the stomach will reduce weight, but the cost is that anything a patient eats becomes all the more important. A patient will still need a daily allowance of iron, vitamins, and other minerals, and getting all of this while reducing their caloric intake by some eighty percent is not an insignificant challenge. One must be prepared to follow a strict dietary regimen, and so undertaking the surgery does not mean a patient gets to eat what they please. In many ways this dietary restriction is significantly more difficult to maintain than to simply lose weight through regular diet and exercise. The screening process for bariatric surgery can take up to half a year, and during this period a physician will monitor your progress in following dietary restrictions. Since following a strict regimen post-surgery is so important to getting the essential nutrients that one needs, a patient must demonstrate that they can follow such guidelines before the surgery. This means that a patient will likely lose weight prior to surgery by simply following the guidelines of their doctor. It is understood that a patient is inherently having trouble with their weight and that not all of these guidelines will be followed day in and day out, but certain changes in a patient’s weight will almost certainly disqualify a patient from surgery. Weight gain during the screening process is one such disqualifier; this is a sign that a patient is unwilling to commit to certain dietary restrictions and is unfit for surgery. It may also signal to medical professionals that the patient does not have the right viewpoint on the surgery overall. The mental wellbeing of a patient is one of the qualifiers for surgery, and they must understand that bariatric surgery truly is a tool to weight loss, and little more. This is part of the reason why bariatric surgery for young adults and minors is somewhat controversial, as the idea that they can fully internalize the importance of the surgery is up for debate; they are young enough in their lives that they should pursue more traditional weight loss methods. For some, getting cleared for surgery can instill an idea that they suffer from a chronic disease of obesity, while this isn’t far from the truth in pure physical symptoms and conditions, it sometimes has a patient label themselves as obese. A patient self-identifying as obese is an additional warning flag for medical professionals. It signals that surgery is not a solution to the core problem of a patient and that therapy and other forms of behavioral treatment may be better suited for aiding a patient. If you or a loved one suffer from physical ailments due to being overweight then this increases the chances of qualifying for surgery. Early symptoms of diabetes are very reversible (as is late stage diabetes but to a lesser degree), and bariatric surgery increases the chances of maintaining good health and reversing these symptoms (See this study). More complicated and nuanced ailments like early signs of heart disease, high blood pressure, and weak joints and bones are also signs that a patient may qualify for surgery, however these are altogether harder to qualify. They are merely indicators of greater health risks down the line, such as increased risk of heart attack and stroke. For a young patient, such as a teenager, they may not have many of these symptoms or health conditions, but there is still reason for looking into surgery to reverse the mental toll of being overweight. Obesity is highly correlated with anxiety and depression. In the formative years of a teenager, such mental ailments can become lifelong conditions that lead to difficulty in every aspect of daily life, ranging from employment opportunities, to forming friendships and more. This is an extremely nuanced issue, and if you are a parent considering the options of surgery for your son or daughter, you will want to confer with them to check the status of their mental health. Relay this information to their primary care physician to better determine if bariatric surgery is right for your family. While the expenses and recovery from the surgery can seem extreme, in comparison to the lifelong issues stemming from mental health conditions, it may be in the best interest of your family to commit to surgery. These are all things to take into account as you determine whether or not to pursue this avenue of medical treatment. It is an extremely difficult decision to undergo surgery if a patient is under the age of eighteen, and even at this early stage of adulthood it can be difficult to find medical professionals willing to commit to the surgery. However, the increased prevalence of doctors willing to suggest surgery for minors and young adults will only continue to increase over time. It is because of this changing viewpoint that you may want to seek medical professionals specifically tuned to treating minors, knowing that a decade from now it is likely that your current doctors would be more willing to recommend the procedure, and that you are merely thinking down the line. Even for non-minors, most doctors will not recommend surgery for patients until they have tried diet and exercise for a number of months, and even then there is a prevailing attitude in the medical community that unless medical issues stemming from obesity are life threatening, they should not undergo surgery. If you truly believe that surgery is the best chance to successfully lose weight, then consider visiting another doctor. This may seem like going around your primary care physician, and indeed it is, but when the prevailing attitude does not allow for surgery, you may have to take action into your own hands and find a doctor willing to aid you and your family in this venture. The BMI scale is an inherently flawed way to measure obesity, however it requires just two measurements and is the most common form of measurement. The BMI does not take into account muscle mass or bone density. If you are obese on the BMI scale, but used to lift weights, you will find that the BMI may not accurately reflect the degree in which you are overweight. This is a key aspect of determining if a patient qualifies for surgery, so make sure that you speak with your medical professional and determine the degree to which you or a loved one are overweight. More importantly, post-surgery and as a patient measures their success in weight loss, strength training will become an important component in maintaining good health. Here is where the BMI scale can sometime scare patients into thinking that they are at more risk than they truly are – a patient should keep this in mind as they gain muscle mass, since the BMI scale will become more and more incomplete in describing a patient’s overall weight as it relates to their height. Progress made post operation should be measured by how a patient feels, their energy levels, and how their prior existing conditions are regressing. They should not just rely on the BMI scale to determine the overall success of their weight loss endeavor. Bariatric sleeve surgery is not a perfect solution to obesity, but truly no options are perfect. There are many advantages specific to surgery and it is important that you and your family are fully aware of what is at stake. Life post-surgery is an adjustment to normal activity, and making an informed choice requires all of the facts and information. As you read this and look through the advantages and disadvantages, I can’t stress enough that my overall view is that bariatric sleeve surgery pros outweigh and potential disadvantages. From experience, one must go into this endeavor with the right viewpoint, and the only way to solidify that picture in an accurate way is to have as much information as possible. Patients typically lose sixty percent of their excess body weight (fat) in the first two years post-surgery. This is with following strict adherence to the dietary regime prescribed by medical professionals. Many patients will qualify for this type of surgery, and even if one doctor does not clear a patient, a different doctor is likely to approve of bariatric surgery. This is not going around a doctor so much as it is finding one that is more up to date with the current medical practice of bariatric surgery. In addition, the age of a patient can be as young as fourteen, although it is typically not done on patients younger than eighteen to twenty years old. Comorbid conditions related to obesity are typically reversed within the first year following surgery. This is variable depending on the conditions and the age of the patient, but overall the point is that severe issues stemming from obesity are reversible and do typically start to reverse in the first year. The advantages of this are plain to see, but they also include added benefits like not needing to take diabetes medication, as well as reduction in needing to take medication for high blood pressure. The success rate of patients that have undergone bariatric sleeve surgery nears 100%. A patient will lose weight in the year to two years post- surgery and the rate of weight loss is at about 15lb per month, although this number is highly variable depending on the starting point of the patient. Where the success rate is not so clear is in the long term outcomes of patients. The data here is just not available for the long tails on how patients do with diseases relating to obesity. While the current view is that most diseases are reversible with the surgery, there is a real possibility that the stomach will expand over time. This expansion will overall be far less than if the patient had undergone bariatric band surgery, and the stomach will never reach the original size prior to operation, but one must be aware that success rates in the long run (20-30 years) are currently unknown. Bone and Joint Issues: Long term obesity damages bones, causing micro fractures and reducing bone strength overall. In minor cases this simply causes discomfort, but in greater cases it increases the risk of greater injuries to bones and joints. Hypertension: Associated with many long term health conditions, ranging from heart attack to stroke, hypertension is a clear sign of poor health. High blood pressure forces the heart to work harder, and while the exact causation for how hypertension relates to most heart related illnesses is still debated, the correlation is clear – hypertension results in long term health consequences that are debilitating to living a normal life, and can be life threatening. Sleep Apnea: Obesity is associated with higher instances of sleep apnea; that is the body not getting enough oxygen during sleep. At the very least, patients with sleep apnea report being more tired during the day because the quality of their sleep at night is poor. In worse circumstances, it increases rates of heart disease and stroke. In the worst case scenario, sleep apnea can cause sudden death during sleep, however this last case is rare. Diabetes: 29 million people in the United States have diabetes – it is one of the most common chronic diseases today. The long term health consequences of type two diabetes are higher rates of heart attack and stroke. Patients must monitor their blood sugar levels several times per day and may become reliant on insulin to control their blood sugar. In rare cases it can lead to blindness or loss of a limb. Mental Health Issues: The mechanism is not at all clear for many of the mental health issues associated with obesity, however among obese populations there is a greater rate of depression, anxiety, bipolar disorder, and schizophrenia. Often these issues go untreated for years, or are never treated at all. In addition, there is some level of eating disorder associated with many that suffer from obesity. The recovery time of the surgery is just one to two days in the hospital post- surgery. Following this period, the patient must follow a strict diet to ensure that they are getting the proper nutrition based on their limited caloric intake. They are able to return to work one to three weeks post-surgery, depending on their field. The patient cannot participate in heavy lifting (greater than 10 pounds) for six weeks post operation. All of these are extremely minor inconveniences for this type of surgery. Most importantly, a patient undergoes this surgery without a large incision. Instead, a small incision can be made in the abdomen and tools with fiber optic cameras can complete the surgery in around two hours. The overall cost of this surgery is relatively low, with an average out of pocket cost of $14,000. This is a large sum of money, but in comparison to the cost of health complications from obesity it is extremely minor. In addition, insurance companies are increasingly covering part of the cost of this procedure. From the viewpoint of an insurance company, covering the cost of surgery now means reduced costs in the long run care for that patient. It cannot be ignored that the cost of surgery is rarely fully covered through insurance. While the cost in the long run is far less than treating all of the complications that form from obesity, the price of surgery is still far greater than losing weight through diet and exercise. A good diet and correct exercise will always be the preferred method of weight loss whenever possible. Post-surgery, a patient’s diet will consist of liquids for two weeks. They will then move on to a soft mush style of food, similar in texture and form to baby food. A patient will then move onto soft foods and eventually around the one month mark be able to eat solid foods. The major disadvantage here is that the reduction in the size of stomach means that everything a patient eats becomes far more important. They will need to get the right amount of nutrition from the food that they do consume, and cannot rely on eating more of one particular food to get vitamins and minerals. The diet will be far stricter than trying to lose weight in a natural way. In addition, eating in general is very difficult for a patient. It can be painful to eat a meal as the stomach recovers from surgery. Patients often have to force themselves to eat to ensure that they are getting the right nutrients. The major disadvantage of bariatric sleeve surgery is the excess skin that will sag when a patient loses weight. The degree to which this both bothers patients, and in how much skin sags, is highly variable on the individual. The degree to which the skin sags is both a function of the patient’s age and height, as well as external factors like how their skin has been stretched over the years. Most patients will suffer from some degree of excess skin as weight is lost. It causes some degree of discomfort for patients, but mostly it is the mental picture that patients have of themselves that suffers most. Patients must be aware that this is one of the steps in the recovery from bariatric surgery, and cannot be avoided. Additionally, sagging skin would develop if a patient lost weight by more traditional methods. This will expand the muscles and tighten the skin in the process. Two, a separate purely cosmetic surgery is available if the patient wishes to go this route. This surgery is fairly expensive, is not covered by insurance, and offers no health benefits aside from the mental wellbeing of the patient. Complications from bariatric sleeve surgery are exceedingly rare, but when they do occur they are very serious. There are three primary complications that one must worry about. All of these complications have severe consequences if not treated immediately, however they are very rare because of the non-invasive nature of the surgery. The complications are internal bleeding, abdominal infection, and complications from the anesthetic used during surgery. Internal bleeding is the most common of these complications, but again it happens very rarely. This occurs when there is a leak from the staple near the cut of the stomach. This leads to internal bleeding from the stomach to the mid- section of the body. This complication is why patients need one to three weeks for post operation recovery depending on their field of work, and also why they cannot lift objects heavier than ten pounds for up to a month. As long as a patient avoids breaking these suggestions as set forth by their doctor, then internal bleeding should not occur. If it does happen, a patient must go to the hospital immediately. They will become aware of this complication by experiencing strong pain in their abdomen. Abdominal infection could stem from the surgery itself, but is rare because of the small incision that is cut in the abdomen. This complication stems from poor disinfection protocols of the tools used during the operation, and would be the fault of the medical team conducting the operation. Major precautions are taken in hospitals so that this does not happen, and instances of this are very rare. This can be treated with antibiotics but will require a patient to visit a hospital to find why the problem occurred. A patient would become aware of this complication very shortly after surgery, as they would develop a fever, as well as severe pain in the abdomen. The most severe complication of this surgery is related to the anesthesia used. A patient is fully under anesthetic during the operation, and if the wrong amount of anesthetic is used then the patient can fall into a coma. This is a worry of all operations that require a patient to be fully asleep during surgery, and instances of this are exceedingly rare in every country, but especially in the United States and European countries. It is something a patient should be made aware of, but nothing that should cause them to not to go through with surgery. I can’t believe that the recovery time for this operation only took one to two days? Great post. I think this would be a very much helpful catch-up in considering this option to solve obesity.